Kim, Kylie, Khloe, Kendall, and Kourtney – the Kardashians are everywhere. Even Caytlin Jenner is all up in the news these days. Fed up with seeing articles about them? Tired of checking out celebrity sites only to have them filled with photos of this clan? 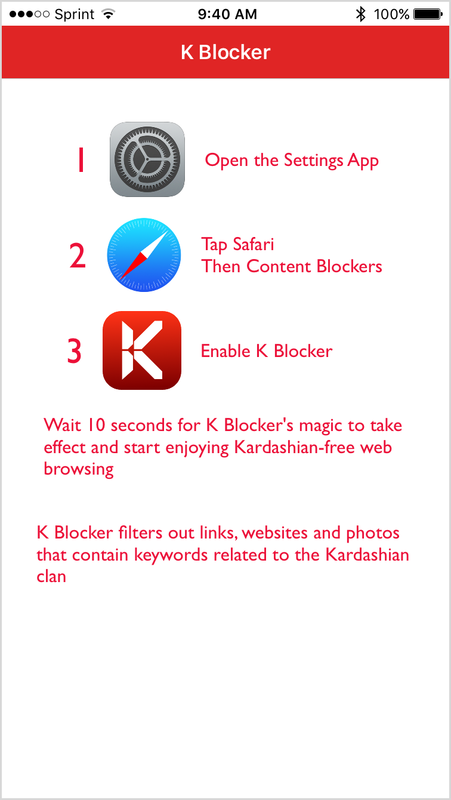 Stop the madness and get rid of them all with K Blocker, the new app that provides a Kardashian-free browsing experience. How can I rid myself of them? After installing this handy little app, you just hop over to your Safari settings and enable it as a Content Blocker. Then, enjoy browsing the Web and checking out your favorite entertainment sites without a Kardashian in sight. The app also claims to work with Caytlin Jenner and Kanye West for an extended elimination experience. Will they be gone everywhere I go? K Blocker works with a large number of websites, but cannot promise a complete, 100 percent removal of a Kardashian while you are browsing. It will attempt to keep URLs with Kardashian-related keywords, photos, and content out of sight. And, it may change the display of the page as it blocks items, however, this could be well worth it to you. 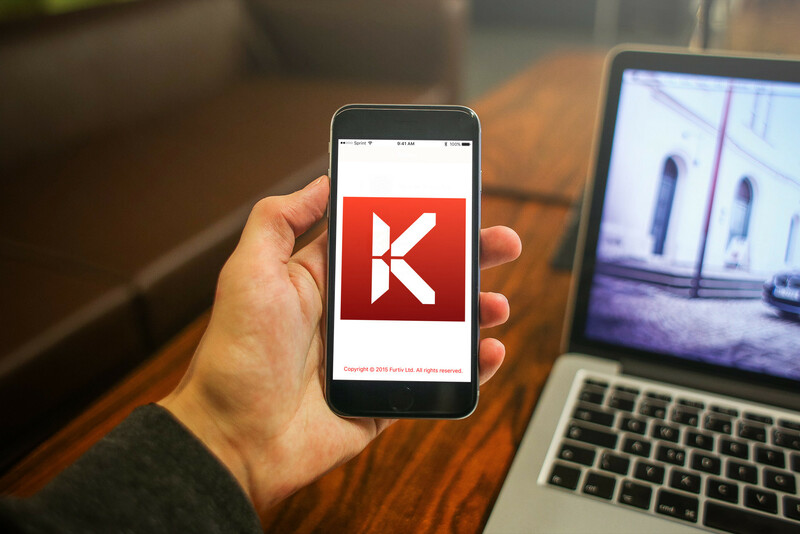 Note that K Blocker will not work with apps like Facebook and Twitter. How well does it keep them away? 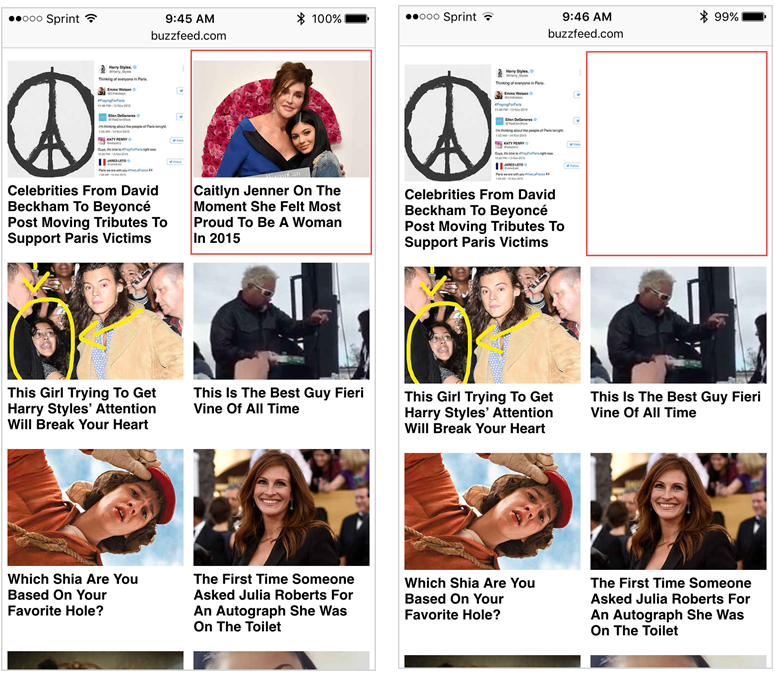 I checked out a couple of sites including BuzzFeed, which seemed to work well as you can see above in the amazing “before and after” image. Unfortunately, I was greeted with a Kardashian right on the main screen of People.com. So, true to their words, the creators of the app cannot guarantee you will never see another Kardashian, but it is definitely worth a try for those who are really ready for a Kardashian-free life. 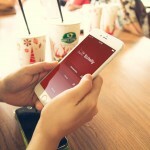 K Blocker is compatible with iPhone, iPad, and iPod touch and available for just $0.99 on the App Store. The app is not recommended for fans of the Kardashians. In other news, take a look at Don’t expect a hybrid between MacBooks and iPads anytime soon or Find money for college with Scholly: Scholarship Search.